Have you ever been to a quilt retreat? How about a quilt retreat on a cruise? I�ve just returned from the Mexican Riviera with the Quilt Camp at Sea group. What a great time we had. Our group was small which gave the students more individual help and the chance to really get to know each other. We arrived in San Diego on Friday and enjoyed walking around town in sunny 85 degree weather. 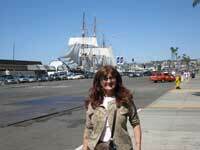 See the picture of my good friend Jackie Wolff in front of the pirate ship docked in San Diego. 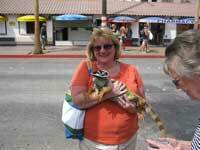 The next day we boarded the Oosterdam in the Holland America fleet and set sail for Puerto Vallarta. It took us two days to arrive. While at sea we had quilt classes. The first class I taught was �La Fiesta�, a new pattern designed especially for this cruise. It�s a 42� square table topper in bright colors with photos of the ship and ports we visited and it�s finished off with prarie points. I had my first male student in class. He did great!. The second class I taught was �Memories of Mexico 2012�, also designed for this cruise. 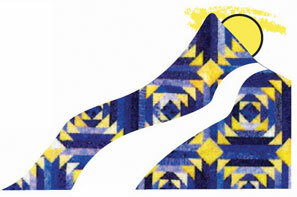 I was asked to do a pattern similar to the memory quilt I designed in 2006 for the Debbie Mumm cruise to Alaska. This is a smaller version with pictures that relate to Mexico. . When we arrived in Puerto Vallarta I chose to stay onboard ship. I was happy to do open sewing with the girls who also decided to sew instead of shop. I got so much hand work done on this trip. It was great! 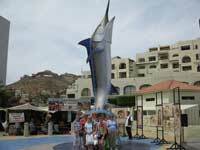 The next port we stopped in was Cabo San Lucas. I did get off the ship in this town and enjoyed more sunshine and a little shopping. 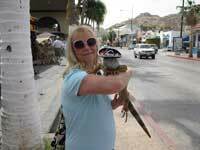 See the pictures of my friend and co-teacher Anita Mahoney and her friend Karen holding an iguana. Ole! We had a group photo taken under the Marlin. 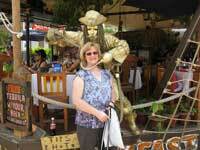 And yes, I did pay this gold painted pirate to have my picture with him. I�m not exactly sure why I�m smiling while he pretends to slit my throat. 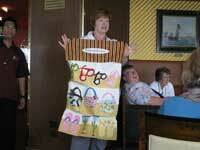 At the end of the cruise we had a farewell party where everyone shared their class projects. I wish I could include all the photos. The ladies did an amazing job on all their quilts. All in all it was a great trip and I enjoyed getting to meet new quilt friends. 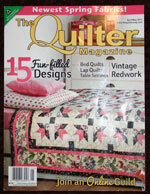 I don�t know how many of you subscribe to �The Quilter� magazine, but if you do, check out three of my new patterns. In the February/March issue you�ll find �Main Attraction� that I designed on page 44. 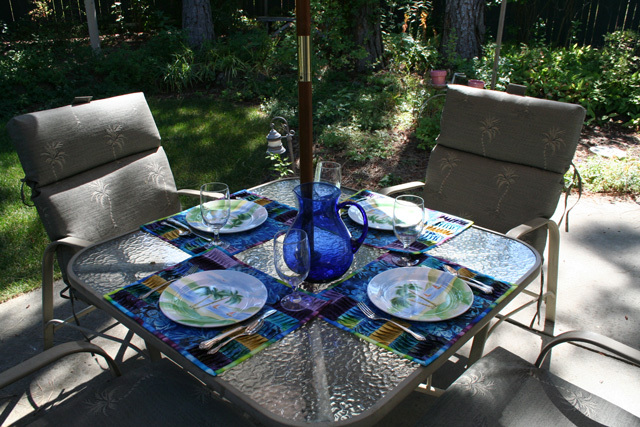 And in the April/May issue is �Butterfly Blooms� on page 56 made with Laurel Burch fabric by Clothworks as well as �Twist and Turn� placemats on page 68 made with Benartex Batiks. These patterns will be available soon on my website. Wow! I�ve obviously been doing a lot more sewing than blogging. I�m not sure I could even attempt to catch up on all that�s happened since last October. I think I�ll start with the present and move forward. Quilt Market was last week. Although I wasn�t there in person, I sent a couple quilts to help decorate the Benartex booth. Market samples are always a fun challenge to produce in a very short amount of time. It felt funny designing a Christmas quilt in April. Here�s a sneak peek. It�s not a pattern for sale yet, but will be in the near future. I�ve had a pretty light teaching schedule as I had foot surgery. It slowed me up for a few weeks, but I�ve become a master at left foot sewing. One of the new patterns hot off the press is �Stardust�. 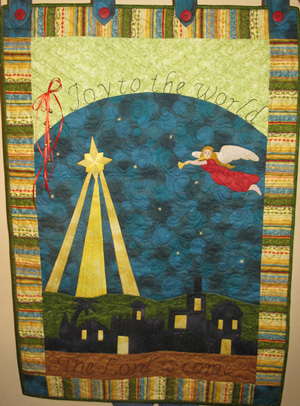 Originally it was designed as a Christmas quilt with some gorgeous large print batik fabrics. It�s perfect for using a jelly roll along with either a focus fabric or a pre -printed panel cut up into blocks. Another new pattern out is �Shabby Chic Rag Quilt�. The majority of the quilt top is pieced with cotton. 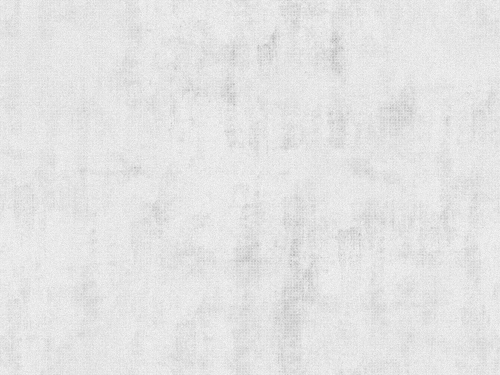 A flannel frame is added to each block so you have something to �rag�. 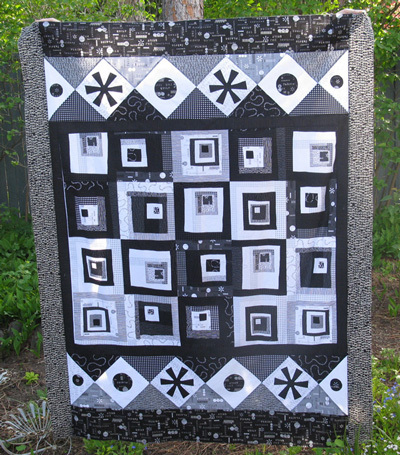 It�s a fun, fast quilt as you go project. 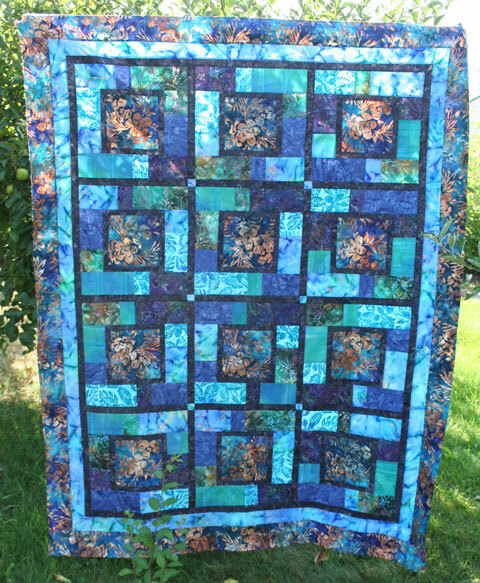 This quilt originated from the need to come up with a pattern using lots of small fabric pieces. A friend of mine is making and selling purses to raise money to adopt a child from China. She asked if I could help her make a keepsake quilt for baby Eva with all the purse fabric scraps that were leftover. 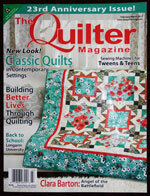 Almost out on the newstands is the July issue of The Quilter Magazine. 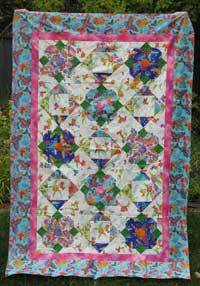 Look for my �Butterfly Dance� pattern on the front cover and pattern inside. This is a table topper that looks very summery. It combines piecing and appliqu�. Are any of you interested in taking a quilt cruise to the Mexican Rivera? 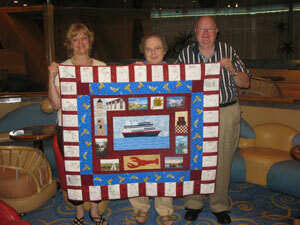 I will be teaching with Quilt Camp at Sea and we will be sailing on Holland America in spring of 2012. It�s great to sew while at sea and enjoy sightseeing while in the various ports. 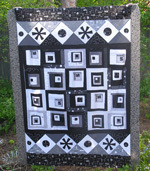 I�ll be teaching a Pieced table topper (or wall hanging). �La Fiesta� is the name of my class. There are pieced waves and two festive Mexican prints. Also included are 4 photos on Printed Treasures of the different ports we�ll be visiting. I�d love to have any of you join us. 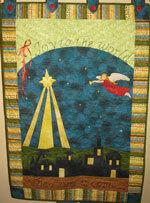 Check it out at www.quiltcampatsea.com. Information and photos for this cruise will be on that website the middle of June 2010. As many of you may know, life was very much on the go with me this summer. I�ll try and catch you up on things and attempt to keep you filled in on a more regular basis now that I�ve added a blog to the website. 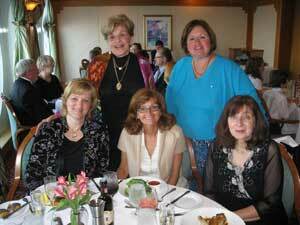 In late June I had the privilege again of sailing to Alaska with Quilt Camp at Sea. Designing and teaching another cruise memory photo quilt was a lot of fun. The ladies in my class were so enjoyable. It was a relaxed class with more handwork that machine sewing so we were able to visit quite a bit. 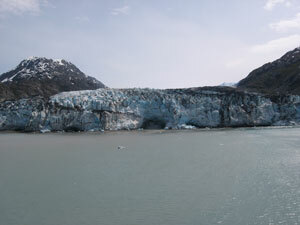 Although I�ve been to Alaska�s Inside Passage before, there�s always something new to see and the glacier is always breathtaking. I braved a new shore excursion this time and went zip-lining! I was quite relieved to realize that we didn�t have to just hang on for dear life, but were harnessed in. I was afraid to go for fear I�d drop to the forest floor never to be seen again! It was a blast! One week after I got home from Alaska I left for South Africa. My sister, Alison and friend Angie and I went on safari for three days in Kruger Park. It was absolutely amazing how many animals we saw and photographed. From there we crossed the border into Mozambique and spent three weeks at an orphanage called Zimpeto that was started by Iris Ministries. I taught the girls there how to quilt. They were anywhere from 10 years old to 27 years old. It was a very rich and rewarding experience! I was blessed as much or more than they were. They were so eager to learn and did very well. 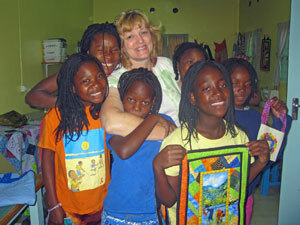 My hope is that learning to quilt will give them a life skill to hopefully earn money from. I grew close to these girls in the time I was there and want to go back and teach them some more. I am currently raising money to return either this summer or next. I�ve just finished a raffle quilt with a safari theme to also raise money to go. Anyone interested in tickets? View the African Project page to purchase. Once home from Africa I left 4 days later to join Quilt Camp at Sea on a New England cruise, although this time I was more of a student than teacher. It was fun to experience taking rather than teaching the classes. My dinner tablemates were a highlight of the trip for me! Pat Buckley Moss and her daughter, Mary were so much fun. They went on numerous excursions and filled us in everyday. Then there was Laurette Koserowski, the most soft spoken person I�ve ever met! Funny thing is, she was the one with the funniest stories and misadventures EVERY DAY! Even the day we didn�t go ashore, she had a story for us. And of course, my good friend Jackie Wolff was always fun to hang out with. Pat and Len Tobin really outdid themselves on this cruise with oodles of prizes and fun gatherings for the quilt group too. It took several weeks to reorient myself to regular life, but I�m back to stay now for awhile. 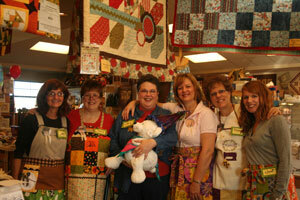 Yesterday, October 31st, was Jackie Wolff�s 25th anniversary of owning The Quilting Bee in Spokane, WA. We had a great time celebrating with friends in the community. There was a drawing at 25 minutes past every hour and hidden bees that could be turned in for prizes. People came in costumes, brought items for the food bank and wore overalls (Jackie�s signature outfit) all to receive extra discounts in the store. Monstrous Cupcakes from Costco were served by the dozens. Tons of items were on sale and a �Blast from the past� line of fabric �Hello Betty� was sold at prices from 25 years ago, $4.99 yard. All in all it was a fun celebration. Happy 25th Anniversary Jackie! © Copyright 2016 Cool Water Quilts. All Rights Reserved.